“All The Hits!” From Pop, Hip Hop, Alternative, and Dance, we’ve got you covered. We pride ourselves on being the only place, where you can hear all of your favorite songs on one station! 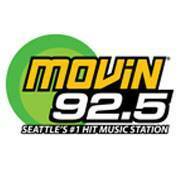 We are Seattle’s premier Top 40 radio station, while boasting one of the West Coasts biggest morning shows, “Brooke & Jubal in the Morning.” This coupled with one of the nations most active social media fan bases, our brand and entertainment strategy continues to be a 360 approach. Whether we connect with you over the air, in person, or on your phone, our mission is simple, to entertain you!